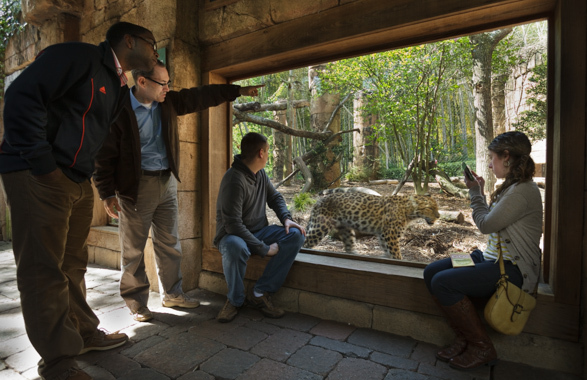 Shape your worldview by exploring the wonders of God’s creation. God’s command to subdue the earth and have dominion was not only to Adam but is also to all of his descendants. At BJU you’ll learn the importance of studying God’s creation and the unique privilege we have of taking care of all He’s given us. Our science education program will prepare you to be an effective, innovative and Christ-centered science educator in classrooms around the world. This program is approved by the South Carolina Department of Education, leading to initial South Carolina state licensure (licensed to teach grades 7–12 in a public school setting). 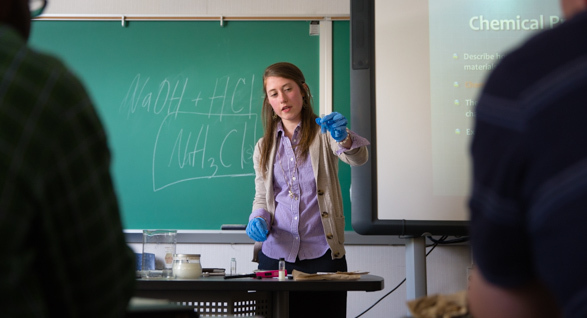 Graduates from BJU’s science education program have been accepted into leading graduate schools and are teaching at private and public schools in the United States and overseas. At BJU you’ll take challenging science courses that build a firm foundation in science and prepare you to teach. All courses are taught from a literal six-day recent Creation perspective. Within the program you can choose between two tracks: biology and composite science. Focusing on biology allows you to explore in depth the science of living things. In this track you’ll gain a solid understanding in the basics of biology, such as how cells function, and you’ll even delve into other complex subjects, such as virology. Or if you choose the composite science track, you’ll take a broader look at science, with courses in geology, astronomy and chemistry—to let you prepare for a wider variety of teaching roles. Nearly every week you’ll spend time planning, executing and reporting laboratory experiments. You’ll go beyond learning the facts to understanding the concepts and learning to think like a scientist. In addition, you’ll take methods courses that challenge you to think outside the box as a teacher. You’ll learn about tickets-to-go, graphic organizers, think-pair-share and many other effective educational strategies. You’ll also receive training in the most up-to-date educational technology, such as probeware to use in labs and Promethean boards, providing even more exciting tools to help your students learn. You’ll analyze curriculum from a variety of publishers and learn to conduct effective science demonstrations and lab exercises. A review of national science content and teaching standards will prepare you for your chosen profession. At the end of the day, living for Christ is what really matters. Bob Jones University is committed to helping you follow Christ, the Ultimate Teacher, whether in public school, Christian school or overseas. The BJU Core gives you ways to relate to your future students, parents and colleagues. You’ll study subjects like history, philosophy, the arts and speech to give you better reasoning and communication skills. Your liberal arts studies, in addition to your Bible courses, will help you see the big picture, from Creation onward, which in turn will help you understand God’s plan and purpose for you. Throughout all of your studies, you’ll lay a solid foundation in the Word of God, so you’ll know what you believe and be able to share God’s truth with others. Because the science education program is comprehensive, there are no electives included. However, you can take online courses during the summer to free up your class schedule during the semester. Teaching is a highly challenging but richly rewarding career. My education at BJU taught me the importance of loving my students by giving them the best possible education. A good teacher needs patience, flexibility and great subject knowledge; BJU taught me how to have all three throughout both undergraduate and graduate programs. Most importantly, BJU taught me how to emulate the Master Teacher, Jesus Christ. True success as a teacher is found when teachers are able to imitate Christ in their behavior both in and out of the classroom. Without a doubt, BJU helped to shape both my character and my mind. For that, I will be forever grateful. Our graduates take from their education a love for their communities and a desire to strengthen the minds and reach the souls of the next generation. Our undergraduate teacher education program meets South Carolina licensure requirements, so you’ll be ready for teaching upon graduation. Usually we have many times the number of requests for teachers than we have graduates, and the demand for highly qualified science teachers is especially great. The need for teachers gives you plenty of options as you look for a job after graduation. Laurens District High School, Laurens, S.C.
Bob Jones Academy, Greenville, S.C.
Dacula High School, Dacula, Ga.
Nashua High School South, Nashua, N.H.
Inter-City Baptist School, Allen Park, Mich.
Upper Bucks Christian School, Sellersville, Pa. Textbook author, BJU Press, Greenville, S.C. Physical therapist, Freedom Plaza Care Center, Peoria, Ariz. Your teaching preparation moves gently from classroom observations to after-school tutoring to practicum two mornings a week. Meanwhile, your methods classes will give you plenty of practice in lesson planning. By the time you begin your clinical practice your senior year, you will be well prepared with numerous lesson plans under your belt and at least 100 hours of classroom experience. Clinical practice, the capstone experience of your teaching preparation, gives you the opportunity to work with a mentor teacher in a local public school and receive timely feedback in weekly meetings with a BJU professor. This semester of clinical practice, along with completion of required classes, passing scores in the PRAXIS II exam and a favorable recommendation, leads to initial South Carolina state teacher licensure for grades 7–12. Science education can take place anywhere, and your professors recognize that. You will have opportunities to participate in nature hikes for observation and field studies. Field trips to informal education facilities will show you how you can use outside experiences effectively in your teaching. Our science and education faculty are passionate about education, and they go above and beyond expectations in preparing you for the classroom. Most of the faculty hold terminal degrees and teach in their areas of expertise, such as chemistry, physics, plant physiology, microbiology, instructional technology, special education, or curriculum and instruction. In addition to providing relevant content, they serve as model teachers for you to emulate as you begin your career. Present the content in science within the framework of a biblical worldview. Design lessons that incorporate scientific concepts and principles to diverse students, using a variety of appropriate instructional strategies. Plan and conduct inquiry-based exercises that demonstrate adequate safety procedures and the ethical treatment of living organisms, where appropriate. Develop inquiry and higher order thinking skills in their students as they examine scientific processes and apply them to their daily lives. Make use of technology, mathematics and research in their own study of and teaching of science.